Available now! The Molecule World User Guide! New versions of both Molecule World for the iPhone and the Molecule World iPad apps that correct this problem are now available in the App store. ​What are some interesting molecules to explore? How do I change the drawing or rendering styles? How do I find out what the colors mean? How can I look at molecules that aren't packaged in the application? What kinds of molecules can I view? 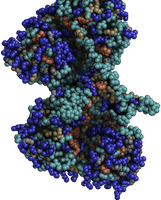 Can I download and view molecules from the NCBI? or the PDB? PubChem? What does the camera icon do? How can I use Molecule World to discover interesting things about molecules? I have an idea for a teaching activity but Molecule World doesn't quite do what I need it to do, what can I do? Why are the atoms in Molecule World shown in different sizes? Do the sizes mean anything? Will Molecule World be available on Android / Windows / phone / MacOSX? I don't have an iPad - what else can I use? I have a question that isn't in the list. What are some interesting molecules to explore? Both Molecule World and the Molecule World DNA Binding Lab come with several molecular structures for you to explore. The structures in Molecule World represent proteins and chemicals that are commonly discussed in high school and college biology, such as hemoglobin, human insulin,cytochrome C oxidase, glucose, caffeine, and more. Learn how to get new structures in the Molecule World User Guide and check out examples on Facebook. Then, touch the screen somewhere outside of the menu to apply the new styles to your structure. Touch the palette icon to see a color key. If the coloring style is element, the colors will be shown for each element in the structure. If the coloring style is either charge or hydrophobicity, a color key will be shown to indicate which colors correspond to the different states. For the charge coloring style, you will see colors for an amino acid that is either neutral, positive, negatively charged when in an aqueous solution on its own. For hydrophobicity, you will see amino acids colored according to the Wimley–White whole residue hydrophobicity scale. You can search one three databases. 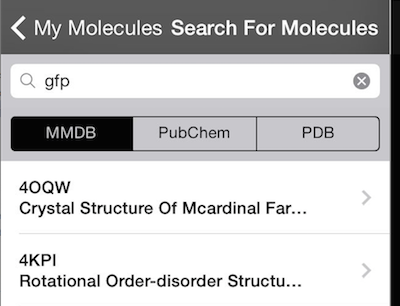 These are the NCBI Structure database (also called the Molecular Modeling Database or MMDB), the PubChem Compound database at the NCBI, and the PDB database. 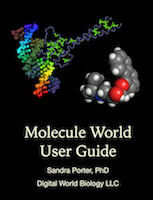 Download the Molecule World User Guide for detailed examples. 1. 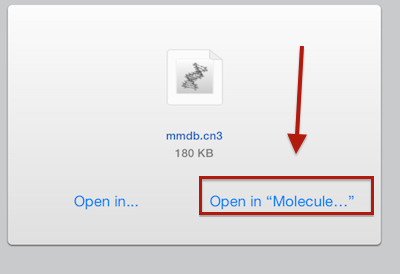 Touch the "My Molecules" button if your iPad is in portrait mode or touch the + if you're using landscape mode. 2. Type the name of structure you wish to find. 5. You will see a list of structures. Touch the arrowhead on the right side of the structure row to see more information. Touch the name of the structure to download it and open it in Molecule World. 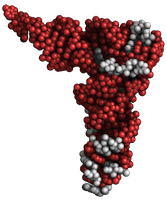 You can view molecules whose structures have been elucidated by experimentation and hypothetical molecules that only exist as pdb text files. Sometimes the structures can vary. NCBI frequently has different versions of structures that show a default biological unit, a version with all biological units, and a version that shows the asymmetric unit. These three versions can look different from each other. Molecule World finds and shows the asymmetric unit by default. If you want to see a different version, you can often find and download those versions from the NCBI. 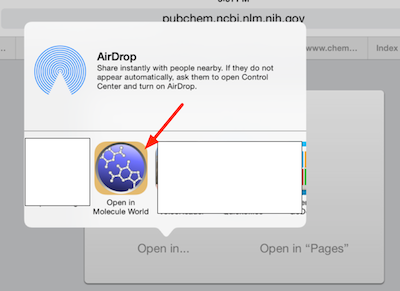 Can I download and view molecules from the NCBI? or the PDB? or PubChem? or other web sites? Yes! All of the above. 1. In Safari, go to the NCBI https://www.ncbi.nlm.nih.gov/ and search the structure database. 2. Pick the structure you want to see and the version you want to see. 3. Touch the View structure button. 4. Touch "Open in "Molecule ..." to open the structure in Molecule World. Sometimes, there are challenges with NCBI structures. If the structure fails to open, reopen Molecule World and touch the name of the structure at the bottom of the list. 1. Go to the NCBI and find your structure. 2. 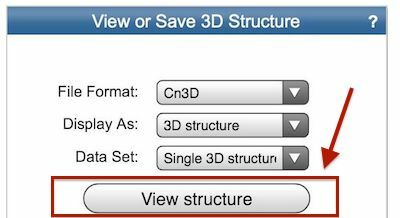 Touch the SDF block on the right to view your options for downloading the structure. Some structures only have a 2D form. Some structures have both a 3D form and a 2D (flat) form. 3. Pick the form you want to see (2D or 3D) and touch the "Save" version to download it. A page will appear where you can choose an application to open the structure. 4. 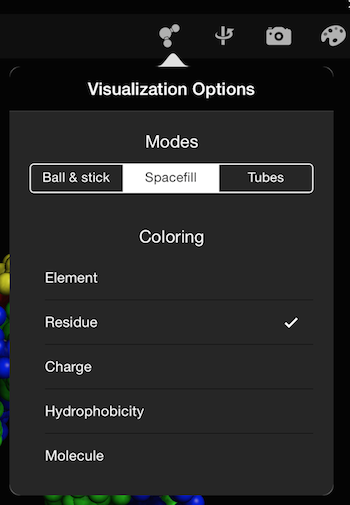 Choose "Open in Molecule World" and you'll see the chemical structure in the Molecule World app. 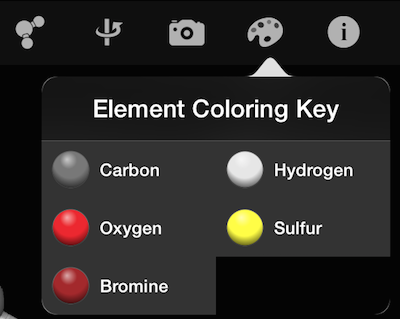 The camera icon lets you capture a great looking image of a molecule. You can tweet your image, send it by text or email, or save it to your photo collection. Teachers can have students capture images to use in lab reports for documenting their work and using as evidence to support their conclusions. Try the different coloring and drawing styles and you might surprised what you discover. We'll post interesting molecules and ways of looking at molecules in our blog and on our Facebook page and Twitter accounts. Contact us! We're happy to help and no matter what, we would like to work with you to make your classroom experience the best it can be. Great question! Yes, the sizes of the atoms are different. When you use the element coloring style, the atom sizes are based on the radii of covalently bonded atoms in organic structures. This makes elements like hydrogen appear as small as they should and larger elements like platinum, appear larger. After all, hydrogen is the smallest element in the periodic table and heavy metals like platinum are larger than elements like carbon or nitrogen. When will this app be available on Android / Windows / Mac OSX? What can I do in the meantime? We are interested in making our apps available on multiple platforms. Please sign up for our newsletter to keep posted on availability and updates. Download the Molecule World User Guide or send us a message through our contact form. Some of us are teachers, too, after all. We're happy to work with teachers and curriculum developers on developing new products or adding new features to fit your needs.